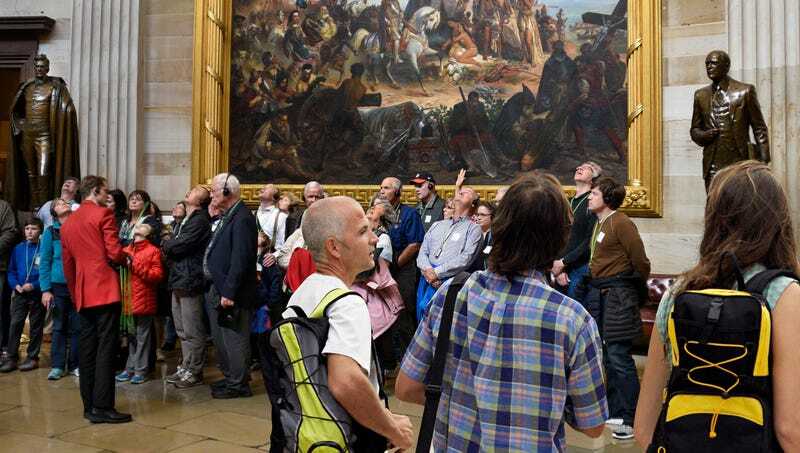 WASHINGTON—Pointing to a more animated presentation style and a charisma that was evident from only a few overheard words, members of the Hidden Treasures Capitol tour confirmed Thursday that the guide one stop behind them was clearly giving a far more interesting tour. “As we were leaving the Rotunda, I could just make him out telling the group after ours some sort of fascinating-sounding story about George Washington laying the cornerstone of the capitol that our guy didn’t even mention,” said tour-goer Lisa Snow, adding that the guide behind them appeared to be cracking jokes and throwing in personal anecdotes to add some local color, in stark contrast to her own docent, whose lack of passion was evident from the way he mumbled through an explanation of architect Charles Bulfinch adding the dome in the 1850s. “I can’t believe I wasted $30 on this loser when I could have been lead around by a real talent if I’d just waited until the 2:30. I even contemplated holding back and trying to sneak into his group, but somebody probably would have noticed.” Snow added that at least she wasn’t with the tour guide one stop ahead, who had repeatedly forced her group to wait around as he wrapped up his long-winded spiel.